Volume Concrete LLC., delivers 1+ around the Portland Metro (excluding Vancouver) 6 days a week. Avoid Skin contact with wet concrete, or unhardened cement. Severe Skin irritation and chemical burns will occur and serious eye damage can occur. Frequent exposure may and will be associated with allergic contact dermatitis. Always wear PPE (personal protective equipment) like eyewear, waterproof gloves, long sleeve shirts, and always pants and rubber boots if standing in the concrete. Always be vigilant about keeping your skin clean from concrete, even the dust and residue after drying will irritate the skin and mucus membranes. Water is highly recommended for cleanup and needs to be available on all job-sites! Driver will need signature for all deliveries inside the curb line before offloading begins. 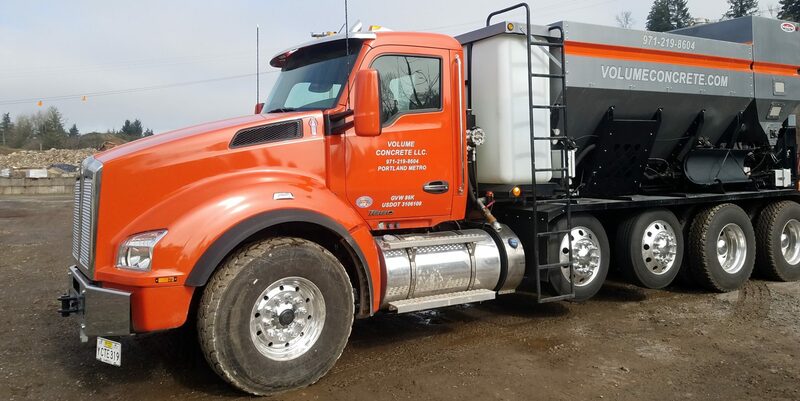 Signing gives permission for the driver to enter the private property and you acknowledge Volume Concrete LLC., is not liable for any damages. Please have a qualified and experienced person for backing up the mixer truck onsite.